My ringtones just got a lot more interesting. 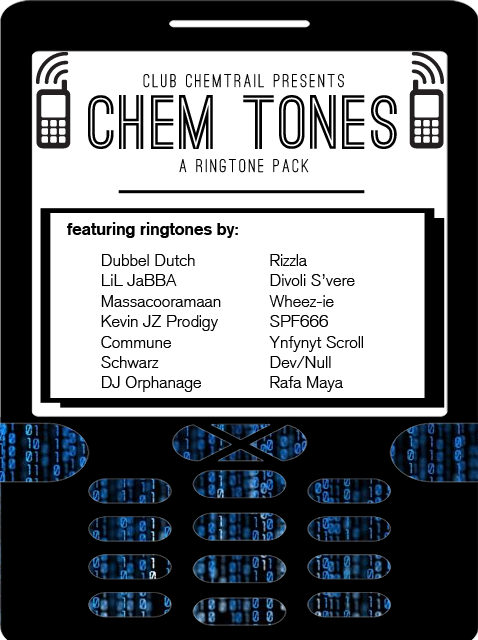 Noticed that my friend Wheez-ie contributed a ringtone to this free Club Chemtrail compilation (it’s a dark little bit called “This Is IT”). Currently getting hyped on “RING TONEZ” by Schwarz, “Swine Shrieks” by Massacooramaan and “Text (txttone)” by Divoli S’vere. This is a rad idea, and an underused approach to sharing sounds. I’ll be eagerly watching the Club Chemtrail crew and their future moves.